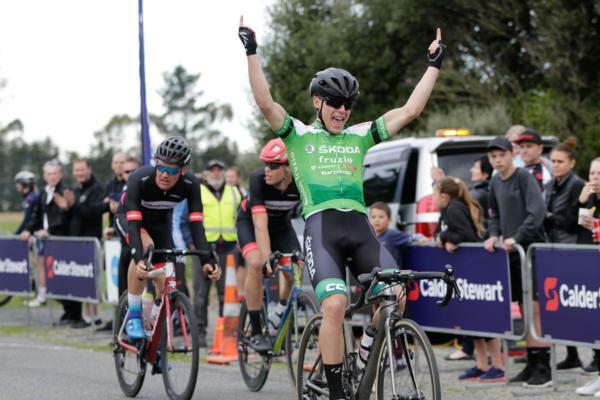 New Zealand's junior track cycling world champions and medallists will go head to head with some of the country’s leading professionals as the Calder Stewart Cycling Series swings back into action with the fifth round in Nelson on Saturday after a winter break. Last month in Switzerland the men's quartet of George Jackson, Corbin Strong, Bailey O'Donnell and Finn Fisher-Black won gold in the 4000m team pursuit while the women's team pursuit combination of Ally Wollaston, Annamarie Lipp, Sami Donnelly and McKenzie Milne finished second behind defending champions Italy in the final. Saturday’s Nelson Bays Motor Group Nelson Classic 121 kilometre elite men’s race will see Strong and O'Donnell racing as team mates for Team Skoda Fruzio while Lipp will ride in the women’s 102 kilometre event in support of her Velo Project team mate Kirsty McCallum from Hastings who is leading the women’s series. Donnelly is riding as an individual. One of the country’s leading female professionals and current Oceania women’s’ road race champion Sharlotte Lucas has had to change her focus from this month's UCI Tour of Ardeche in France and the Road World Championships in Austria to racing in Australia and New Zealand after controversially withdrawing from selection after Cycling New Zealand added her to the squad after she was initially not selected. Lucas, who was fourth at this year’s Commonwealth Games and second in the Tour of America’s Dairyland in the United States, said her whole focus had been on racing at the World Championships. The three time Calder Stewart Cycling Series women’s winner said it was “unfortunate” not to be at the race she wanted to be at through no fault of her own and the bizarre circumstances she says unfolded. Commonwealth Games representative McIlroy, who rides alongside Lucas for Australian women’s professional team Specialized, is another rider racing on Saturday who was disappointed not to have been in the frame for selection for the World Championships. The women’s race also features the very experienced Nelson local Karen Fulton who is riding with her daughter Shanne, who was fifth in the keirin at last month’s Junior Track Cycling World Championships, in the Freshchoice Richmond Pomeroys Women’s team that also features Jeannie Kuhajeck. Things are tight at the top of the women’s individual points table with only nine points separating the top four women while Mcllroy has a one point lead over Lucas in the Small Business Accounting Queen of the Mountain Points Classification. Velo Project leads the team classification with a 12 point lead over Mike Greer Homes Women. Southlander Strong, who won the elite men’s race in the fourth round of the series in Timaru in May after recovering from a serious injury in January, says he is looking forward to returning to road racing in New Zealand after a successful stint overseas in the United States and at the Junior World Track Championships. “We've had a strong start in the series and we have many cards to play with our team this weekend and we'll be hunting for a good result in our new Skoda Fruzio kit,” Strong said. Riding for PKF Waterproofing Concepts Christchurch cycling coach Paul Odlin has a four point lead over Michael Vink from Mike Greer Homes while Odlin’s teammate Jono Stewart leads the Small Business Accounting King of the Mountain Points Classification and Team Skoda Fruzio are the leading team. Wellington’s David Rowlands (Christchurch Mitsubishi) will once again go into Saturdays 102 kilometre masters race as the rider to beat across all three age group classifications. Rowland’s leads the 45 to 49 Age group over Christchurch cyclist Justin Sims (Armitage Williams Blue) while Chris Karton (Heartland Ricoh Cycling) won the bunch sprint over Rowlands in Timaru’s’ fourth round to build on his lead in the 35 to 44 age group over Blair Martin (Cycle World Emersons) and Glenn Rewi (Christchurch Mitsubishi). Fast finisher Darryl Kircher (Christchurch Mitsubishi) will be hoping he can do enough over the hills to hold onto the over 50 leader’s jersey he took off Chris Latta (Cycle World Emersons) in Timaru. Rowlands leads the masters Small Business Accounting King of the Mountains Points Classification and his Christchurch Mitsubishi team has a dominant lead in the team’s competition.